Design Burd Inc.Dr. 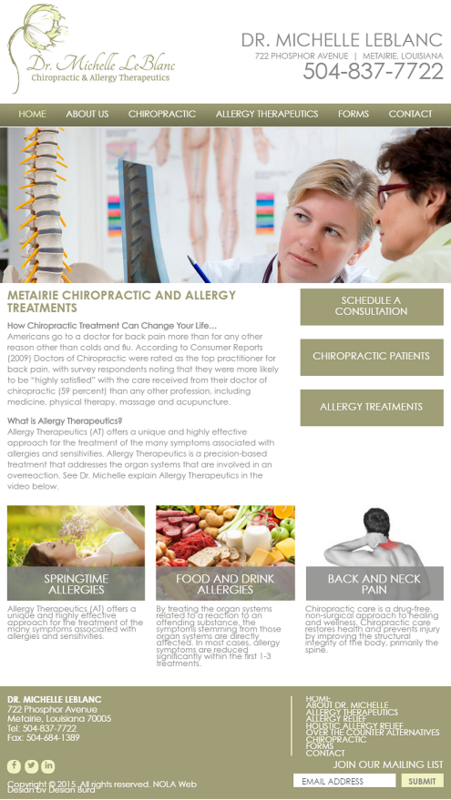 Michelle Leblanc Chiropractic | Design Burd Inc.
Dr. Michelle Lyons-LeBlanc was born in New Orleans and grew up in the small quaint town of Garyville located near LaPlace. After graduating from St. Charles Catholic High School in LaPlace, she attended Southeastern Louisiana University where she made the decision to become a chiropractor and moved to Marietta, Georgia to attend Life Chiropractic University. The site built in Wordpress is focused on providing potential patients with access to the services provided by Dr. Michelle Leblanc. This marketing strategy also goes hand in hand with her SEO campaigns which Design Burd manages on a monthly basis. Each page includes specific content geared towards a clients potential search phrase.